Koren Entertainment offers the following services for private parties, events and shows in the Lehigh Valley (Allentown, Bethlehem, Easton) and surrounding areas. Give us a call to talk about professional disc jockey entertainment options. 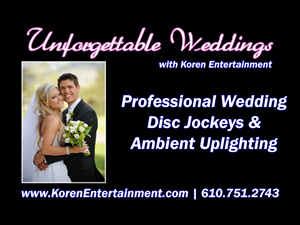 Great parties begin with great music and Koren Entertainment has the best music on the planet! 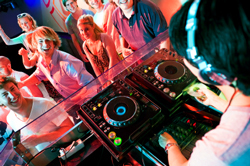 We can spin the perfect mix of the latest Top 40, Dance, and classics on our professional digital sound system while your guests dance and enjoy the party! You can choose music from our online music database or have our professional DJ’s read the crowd and mix the perfect playlist on the fly! Remember when MTV used to play videos? Well, you can have all the classic music videos from the 80’s and all the latest Top 40 hits of today at your party! Not only can you hear the music, but you can see it too. Music videos are displayed on flat screen tvs and can be shown on any available/compatible TV at your venue. It’s like having MTV at your party! Spring Wedding Special $499.00 …Call for details and availability. FireText allows any venue to be turned into a virtual chat room. This service gives people with cell phones the ability to send text messages directly to available TVs at your venue. This classic never goes out of style. Karaoke can be added to any package or be the primary entertainment. Give us a call to see how karaoke can make your event a blast!